The Kuiper belt — the region beyond the orbit of Neptune inhabited by a number of small bodies of rock and ice — hides many clues about the early days of the Solar System. According to the standard picture of Solar System formation, many planetesimals were born in the chaotic region where the giant planets now reside. 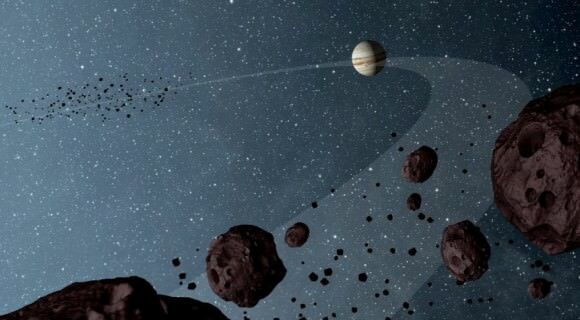 Some were thrown out beyond the orbit of Neptune, while others stayed put in the form of Trojan asteroids (which orbit in the same trajectory as Jupiter and other planets). This is called the Nice model. However, not all Kuiper belt objects (KBOs) play nicely with the Nice model. (I should point out that the model is named named for the city in France and therefore pronounced “neese”.) A new study of large scale surveys of KBOs revealed that those with nearly circular orbits lying roughly in the same plane as the orbits of the major planets don’t fit the Nice model, while those with irregular orbits do. It’s a puzzling anomaly, one with no immediate resolution, but it hints that we need to refine our Solar System formation models. This new study is described in a recently released paper by Wesley Fraser, Mike Brown, Alessandro Morbidelli, Alex Parker, and Konstantin Baygin (to be published in the Astrophysical Journal, available online). These researchers combined data from seven different surveys of KBOs to determine roughly how many of each size of object are in the Solar System, which in turn is a good gauge of the environment in which they formed. The difference between this and previous studies is the use of absolute magnitudes — a measure of how bright an object really is — as opposed to their apparent magnitudes, which are simply how bright an object appears. The two types of magnitude are related by the distance an object is from Earth, so the observational challenge comes down to accurate distance measurements. Absolute magnitude is also related to the size of an KBO and its albedo (how much light it reflects), both important physical quantities for understanding formation and composition. Finding the absolute magnitudes for KBOs is more challenging than apparent magnitudes for obvious reasons: these are small objects, often not resolved as anything other than points of light in a telescope. That means requires measuring the distance to each KBO as accurately as possible. As the authors of the study point out, even small errors in distance measurements can have a large effect on the estimated absolute magnitude. In terms of orbits, KBOs fall into two categories: “hot” and “cold”, confusing terms having nothing to do with temperature. The “cold” KBOs are those with nearly circular orbits (low eccentricity, in mathematical terms) and low inclinations, meaning their trajectories lie nearly in the ecliptic plane, where the eight canonical planets also orbit. In other words, these objects have nearly planet-like orbits. The “hot” KBOs have elongated orbits and higher inclinations, behavior more akin to comets. The authors of the new study found that the hot KBOs have the same distribution of sizes as the Trojan asteroids, meaning there are the same relative number of small, medium, and large KBOs and similarly sized Trojans. That hints at a probable common origin in the early days of the Solar System. This is in line with the Nice model, which predicts that, as they migrated into their current orbits, the giant planets kicked many planetesimals out beyond Neptune. However, the cold KBOs don’t match that pattern at all: there are fewer large KBOs relative to smaller objects. To make matters more strange, both hot and cold seem to follow the same pattern for the smaller bodies, only deviating at larger masses, which is at odds with expectations if the cold KBOs formed where they orbit today. To put it another way, the Nice model as it stands could explain the hot KBOs and Trojans, but not the cold. That doesn’t mean all is lost, of course. The Nice model seems to do very well except for a few nagging problems, so it’s unlikely that it’s completely wrong. As we’ve learned from studying exoplanet systems, planet formation models are a work in progress — and astronomers are an ingenious lot. The first known “Trojan” asteroid in Earth’s orbit has been discovered. A Trojan asteroid shares an orbit with a larger planet or moon, but does not collide with it because it orbits around one of two Lagrangian points. Trojans sharing an orbit with Earth have been predicted but never found until now. Astronomers analyzing data from the asteroid-hunting WISE telescope – which ceased operations in February 2011 – found the asteroid, named 2010 TK7, and followup observations with the Canada-France-Hawaii Telescope on Mauna Kea in Hawaii confirmed the discovery and the object’s stealthy orbit. In our solar system, we know of Trojans that share orbits with Neptune, Mars and Jupiter. Two of Saturn’s moons share orbits with Trojans. Astronomers have known that Earth Trojans would be difficult to find because they are relatively small and appear near the sun from Earth’s point of view. But 2010 TK7 proves that Trojans associated to Earth can be found, and astronomers predict that since one has been found, perhaps they’ll find more, as we’ll learn more about their dynamics and characteristics of their population from this first one. The animation below shows the orbit of 2010 TK7 (green dots). The asteroid is roughly 1,000 feet (300 meters) in diameter. It has an unusual orbit that traces a complex motion near the L4 point. However, the asteroid also moves above and below the plane. The object is about 50 million miles (80 million kilometers) from Earth. The asteroid’s orbit is well-defined and for at least the next 100 years, it will not come closer to Earth than 15 million miles (24 million kilometers). The WISE telescope scanned the entire sky in infrared light from January 2010 to February 2011. The NEOWISE project observed more than 155,000 asteroids in the main belt between Mars and Jupiter, and more than 500 NEOs, discovering 132 that were previously unknown. Astronomers have found a new object in a region of Neptune’s orbit, tucked away in a very hard-to-find location, and where no previous object was known to exist. The object, 2008 LC18, is a Trojan asteroid, which refers an asteroid that shares an orbit with a larger planet or moon, but does not collide with it because it orbits around one of the two Lagrangian points of stability. Six other Trojan asteroids have been located around Neptune’s L4 region, but this is the first one found in Neptune’s L5 region. Scott Sheppard from the Carnegie Institution’s Department of Terrestrial Magnetism and colleagues used a new observational technique that used large dark clouds to block background light from the galactic plane in order to discover the new Neptune Trojan. They used the discovery to estimate the asteroid population there and find that it is probably similar to the asteroid population at Neptune’s L4 point. Jupiter has the most Trojans, 4,076 (as of February 2010) but there are four known Mars Trojans and now seven known Neptune Trojans. So far, searches have failed to uncover any similar objects in the orbits of any other planets. Sheppard and his team, which included Chad Trujillo from the Gemini Observatory, used images from a digitized all-sky survey to identify places in the stability regions where dust clouds in our galaxy blocked out the background starlight from the galaxy’s plane, providing an observational window to the foreground asteroids. They discovered the L5 Neptune Trojan using the 8.2-meter Japanese Subaru telescope in Hawaii and determined its orbit with Carnegie’s 6.5-meter Magellan telescopes at Las Campanas, Chile. Because Trojans share their planet’s orbit they are sensitive to the planet’s formation and migration, and astronomers say finding these objects provide clues that may help unlock the answers to fundamental questions about planetary formation and migration. 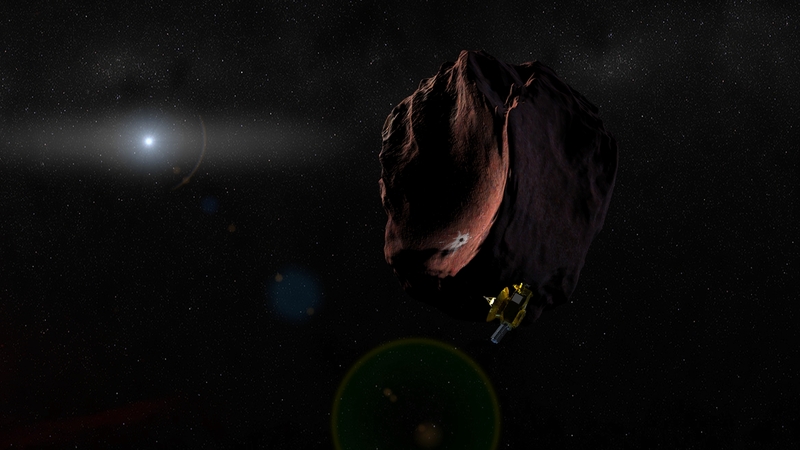 The region of space is also of interest to the teams from the New Horizon spacecraft, as it will pass through this same area after its encounter with Pluto in 2015. Sources: Carnegie Institute, Science Express.